I have never been one to fly by the seat of my pants when traveling. I am a planner... and I love it. I honestly don't know how people take trips abroad without planning. Sure it sounds carefree and spontaneous, but the reality is that most of what you want to do/see will likely be sold out or unavailable (particularly if you are traveling during spring break and the summer). Emily and I are currently in the middle of planning an exciting trip to the Loire Valley and Provence. Even though our trip is almost three months away we struggled to find a good hotel in Avignon. Everything was already sold out! Honestly, we should have started planning sooner, but it was a bit of a last-minute decision. Fortunately, we found a fantastic alternative, but it just reminded my how important it is to plan and research for a trip abroad. If you are going to spend all of that money and time to travel across the ocean, you need to make sure you can see, do, and visit everything you want to! Begin by deciding where you want to go and what you want to see. You want to figure out the best times to travel to that location in terms of weather and tourist seasons (I hate going to places in high season, but in many cases it's unavoidable). If you are going somewhere during high-season, the earlier you start planning the better your results. It is great to dream about where you want to go, but it's important you take care of budgeting and entry requirements before you get too far into planning and purchasing. Obviously your budget will determine what you can do, so you want to set that early to avoid over spending. And make sure you understand what currency the country you are traveling to uses and the conversion rate. You also want to check on your passport (do you have one, is it up to date?) and the country (or countries) you are traveling to entry requirements. In many cases your passport needs six months of passport validity, meaning your passport should be valid for more than six months before you would be allowed to enter a foreign destination. Americans are spoiled and rarely need Visas, but it never hurts to check. Turkey requires you to apply for your visa online and print it out. If you show up without it, you aren't getting in! Once I have decided where I want to go and I have checked travel guidelines and set my budget, I focus on transportation and lodging. Obviously it is important you figure out how your going to get from A to B and where you are going to stay. For some trips this is more complicated than for others. For example, if you want to "get off the beaten track" or explore smaller cities you will have to research trains, buses, and/or car rentals. Without my methodical research, I would have not realized that getting from Italy to Avignon is actually difficult and the easiest way is to fly to Paris (from Florence) and then take the high speed train to Avignon. It seems a bit out of the way, but it's the best option. Begin by selecting dates and then making sure that a flight (or flights/transport) and lodging are available for those dates. Don't book one without checking the other. Emily and I actually had to change our travel dates because the week we originally wanted to fly didn't have a lot of accommodation options, so we had to adjust. I like to purchase all of these major items -- flight, hotel, and inter-city transport (if applicable) -- together to avoid issues. It is worth noting that many European rail lines do not offer tickets online or for purchase more than 90 days out. Don't stress too much over train tickets. Trains, since cars can be added, tend to sell out less. I wouldn't wait until the day of, but a couple weeks (and in some cases days) out is fine. And don't forget to research airport transport. In many European cities the major international airport is not located near the city center. Bonus tip - I love booking.com because they offer free cancellation for many of their bookings. So you can lock something in and are still able to alter your reservation or cancel it entirely for several weeks. Now that you have planned and purchased your airline tickets and hotel, and know how you're going to get around once you arrive, it's time to start filling out your itinerary with activities and excursions. The photographer in my loves to start with Pinterest to see what gorgeous locations are associated with my destination (obviously I am going to need all of the lavender pictures in Provence). Again, you might think that you want to be flexible and leave your schedule open, but I promise if you're going to a major European city in the summer this is not a good idea if you want to see or do certain things. Every summer in Italy I see tourists in Venice, Rome, and Florence spending their entire day waiting in ridiculous lines; lines that could easily be avoided with an online reservation. This just seems silly to me. But of course I don't travel to relax and sleep in, so my advice may not be for everyone. I book as many things in advance as I can. I also like to leave one free morning or afternoon per location/city for the unexpected -- things I didn't know I wanted to do in advance, or ran out of time to see. In the weeks leading up to my departure, I like to create a file with all of my booking references and important information. I save this as a pdf on my computer and on my phone so I can access it where ever I am (and with or without data/wifi). I also like to create a custom Google map and save it to my map ap. That way I have a visual itinerary in addition to my printed itinerary, which yes I print and bring. 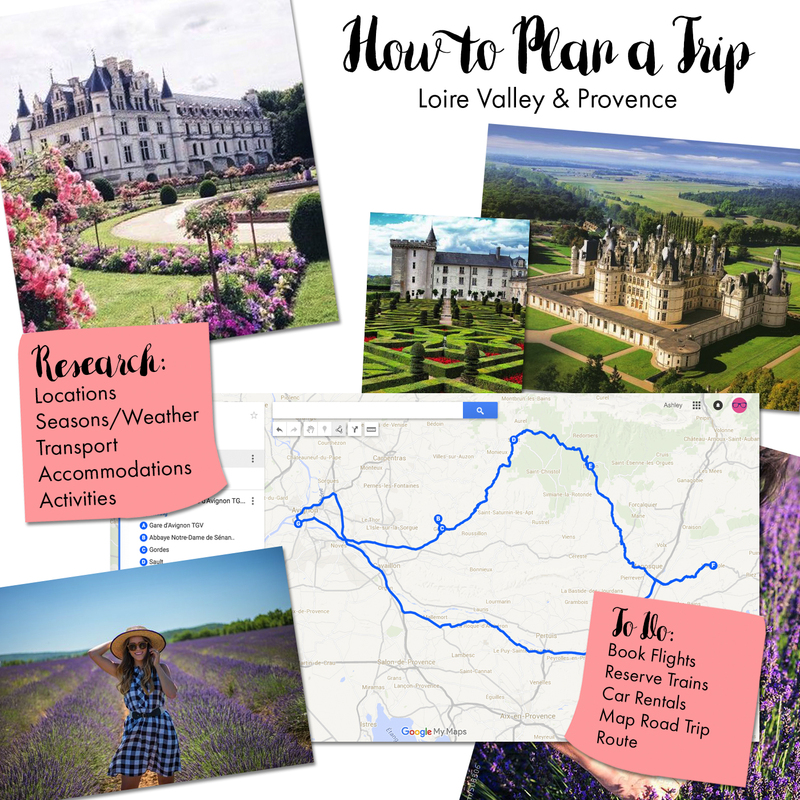 It is also helpful if you want to plan a walking tour or road trip (don't worry, I will be sharing my Provence road trip when it's done). I could go on and I am sure there are plenty of things I missed, especially when it comes to pre-trip prep, but hopefully this gives you a good outline on how to start planning. I have many more travel tips here. And please contribute your tips below! I promise the more you plan the smoother your trip will go! And if you hate planning, consider small group, guided travel, or a study abroad program. And don't think study abroad is limited to collage-age students, we have non-traditional (i.e. mature) students go every year and have an amazing time. Some universities even offer group alumni trips.